Welcome to Day #3 of Chocolate and Peanut Butter Theme Week. 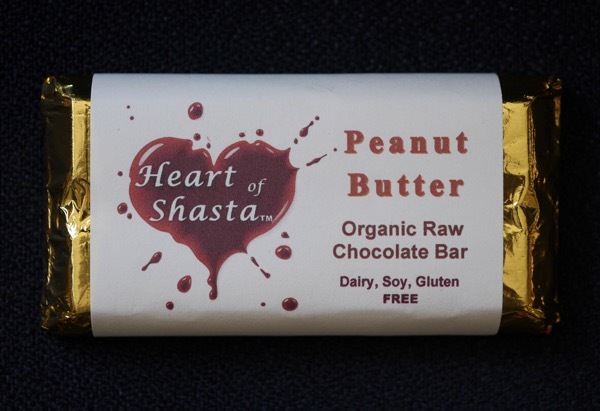 Unlike other chocolate and peanut butter blends and items this week, today's Peanut Butter Organic Raw Chocolate Bar from Heart of Shasta (Mt. Shasta, CA) had a slightly more delicate flavor. The peanut butter filling was a smooth blend of honey, coconut oil and peanuts, and had pleasant, almost floral notes to it. And the chocolate (made from 100% cacao powder and cocoa butter) was more subtle than chocolate made from roasted cacao beans.